Marada is now in the season of Autumn and therefore the layout has been updated with the new Fall version of the site. We also noticed only a week ago that for some computers the site's layout was too wide and therefore caused a side scrollbar at the bottom. Sorry we never noticed this before, both of us have widescreen laptops. But we have noticed the problem and made the side bars less wide and therefore the whole site should be perfect for everyone. The layout is also smaller in size for downloading, so should load faster for those with slow connections. We have only completed the Night version - the Day version will be released in a couple of days. Also, an Email icon has replaced the Addow on the layout, which sadly passed away at the end of Summer. We have changed two of the games. First, Marapet Keeper has been revamped with new graphics and a new look and yesterday's game Protect the Egg has been edited so that its slightly harder. This is a sneak preview of the Princess Costume which will very soon be avaliable with the new Phanty mission coming in a few days. The Lottery has been drawn for this week. cuponer is the winner of the 1,633,500MP Jackpot with the winning numbers of 11, 3, 15, 20, 22 and 24! Congratulations! Last Week's Raffle has now ended. diablo2lod is the winner of the Three Dukka Coin and 100,000MP prize with the winning raffle ticket number 141! Congratulations! Make sure you buy your tickets for today's raffle - only 5MP per ticket! The second game for this week has just been released. Protect the Egg can now be played three times a day, with up to 1,500MP avaliable to win per play! 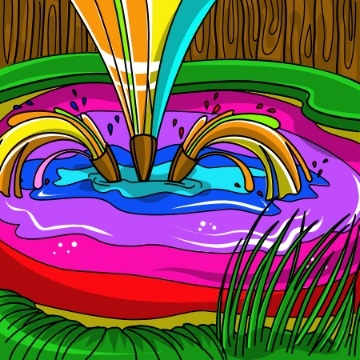 The Lush Fountain has just been discovered in Lush Lake. You can now make your Character totally unique from everyone else by changing the colour of your clothing and shoes (which are coming very soon) for a small fee of 100MP per change. For every Glowing Egg in your nest that you have hatched, you will have unlocked 3 new colours. If you have a full nest, thats 150 different colours for your character's clothing! This change means that there will be a few changes happening to the clothing items we have on the site right now, but we'll let you know more about this in a few days. We've just hidden 3 new Avatars for you to find! We have great news for you all. From today, we are back to a new flash game twice a week. One on Wednesdays and one on Saturday. Today's new game is a card game - Spider Solitare. We've reached day 7 of Character Week and it seems that there is just so much for us to get out for characters that we've extended it by a few days. Day 7 brings the release of the Contact Lenses shop in Lush Lake. You can use these one use items to change the colour of your Character's eyes. Day 6 of Character Week is here now. Today we have changed both Random Events and your Alert Events so that your character talks to you. These also happen more often and even more often if you don't adblock (adblocking is not the same as popup blocking). Awesome! Your pet Obese suddenly gained a health stat. We have also started Half Price Week! All shop items from now are 50% of their original price. Items are also restocking more often. The Lottery has been drawn for this week. windearthfirewater is the winner of the 1,015,300MP Jackpot with the winning numbers of 13, 22, 9, 5, 6 and 24! Congratulations! Last Week's Raffle has now ended. MariSpeed is the winner of the Three Dukka Coin and 100,000MP prize with the winning raffle ticket number 8561! Congratulations! Make sure you buy your tickets for today's raffle - only 5MP per ticket! Day 5 of Character Week is here now. The Salon have opened in the upstair's of the Castle! This means there are 10 new Hair Styles for female characters to get! All you need is a Free Female Haircut Coupon free from the Tombola. We have also updated Maramail to show your character too! Day 4 of Character Week is here and there is a new world! The Upstair's of Baspinar's Castle has just been released! Just like the inside of the castle, you will need to wait until the King is awake before you can enter. The Barbers have opened in the upstair's of the Castle! This means there are 10 new Hair Styles for male characters to get! All you need is a Free Male Haircut Coupon free from the Tombola. Day 3 of Character Week is here, with another new shop opening in Lush Lake. Lipsticks have just opened for female characters with 50 different colour lipsticks already avaliable. Change the colour of your character's lips! Day 2 of Character Week is here, with a new shop opening in Lush Lake. Hair Dyes has just opened with tons and tons of hair dyes. 50 different colour hair dye items are already avaliable, so you are bound to find the perfect colour hair for your Character! We have just started Character Week. As promised, we'll have a whole week dedicated to Characters. This will include the release of shoes, jewellery, new hair styles, new clothes and lots more related to characters! We have changed the Forums and News Comments. It now shows your character when you post. We hope you like the changes. We have some new Disco Pants for male characters restocking. In other news, can you find this Sword Avatar? The Forums have had many changes. We reorganised everything so that every type of topic that is allowed to be posted has its own forum. With the amount of players online recently, our old forums were becoming too crowded and difficult to follow topics. You can also add your favourite topics to a list which is easily accessible. There is also links to your latest posts and topics at the top of every forum so that you can easily follow topics you are chatting on. We hope you appreciate the changes, even if it takes a while to get used to them! There are some new Checkered Dresses restocking at the female clothing shop. We have just added a new flash Game for you to play. Rofling Gold can now be played 3 times a day with a maximum payout of 1,500MP per game. This will be out last week without 2 new games being released. From next week, we should hopefully have a new game released every Wednesday and Saturday. The Lottery has been drawn for this week. charlo is the winner of the 255,600MP Jackpot with the winning numbers of 15, 5, 18, 11, 9 and 19! Congratulations! Last Week's Raffle has now ended. mandieluvzkhyle is the winner of the Three Dukka Coin and 100,000MP prize with the winning raffle ticket number 656! Congratulations! Make sure you buy your tickets for today's raffle - only 5MP per ticket! Its taken a long time to bring back but Gallery Ordering is back. It was really difficult to bring it back without it causing unnecessary strain on the servers because of the large collections of items some members actually have. We're pleased to announce that it is back and its here to stay. You can now order your Gallery exactly how you want, or it will be the default of alphabetical. We have a lot of missing Minipets Hidden Avatars for you to collect. We're added Browse Attic so that you can view only specific groups of your items. We hope you find it really useful. Some new prizes have been added to the Referral Contest. You can now get a White Checkered Dress, White Disco Pants or a Black Disco Shirt. These will retire when the contest is over. We will also be giving away one Ercuw Potion and 25,000MP to the top 10 referrers, as well as randomly for each referral you receive. The Awards are now being given to those who have referred 25 or more people. September is now here and it will be another very busy month for us. As planned, August was a month of repair, maintenance and revamping most of the site. We have completed all of our aims for August and also released a lot more than we had originally planned for, however the Plot has been delayed by about a week and the first installment should start next weekend. August saw our traffic rank increase by 12,000+ places and we've also had the most amount of players online for any month this month - with the user count reaching over 1,700 at one point. We hope that this month we can return to 2 new games a week, release new content for Lush Lake, release the upstairs of Baspinar's Castle, bring back Highscore tables and release lots more content for all of the other worlds. Our main aims for this month is to have lots of Character, Marahome and Battle related news too. We also want September to be the first month without any major delays with releasing new content, downtime or errors/glitches. September shall be another great month for us and we hope to see you all here in October! There is a Funky Costume which can be used on the Sindi, Bolimo and Addow. There is an Enchanted Plushie version of all three pets - you will randomly receive one of them! Characters can also take advantage of the funky theme. There is a Funky Shirt and Funky Pants for male characters and a Funky Dress for the female characters. You can also get a Funky Knife, a funky Psyclone minipet and a Funky Pearl! The September monthly checklist has just been released. You can now complete the goals to enter for September's $1,000 worth of free prizes! A list of the winners for the July-August Contest have been drawn and you will find out in a couple of days who the winners of the $2,000 worth of free prizes are! The Snow Knutt has just been released. Just in time for the extra Snow Costumes the Lottery now is giving out - double the chance of getting one than before! The Snow Doyle has also been revamped, but you may need to refresh a few times to see the new version.